The Business Card Sculptures Golfer is one of our three biggest sellers and one of the great senior gift ideas for sports! It’s for the golfer who doesn’t have everything! 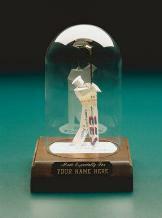 Honor your favorite duffer with this great gift idea or award…a golfer sculpture made out of business cards! Celebrate a hole-in-one or a business deal. The recipient will be delighted! This unique, personalized sculpture under glass is perfect for any occasion or as an incentive award, but for more sports-related gifts, please visit our Sports Gifts category. For seniors sports gift ideas, please look at the Tennis Player, Skier and Fisherman sculptures. We sell a lot of them as retirement and birthday gifts.